We may be Master Mechanics, but many of us are also mothers and fathers. With that said, we’re well-aware that back-to-school season is here. That means your family vehicle is also coming off of summer vacation and will probably start working overtime. Back-to-school time can be hectic but scheduling some time for a vehicle inspection is well worth it. 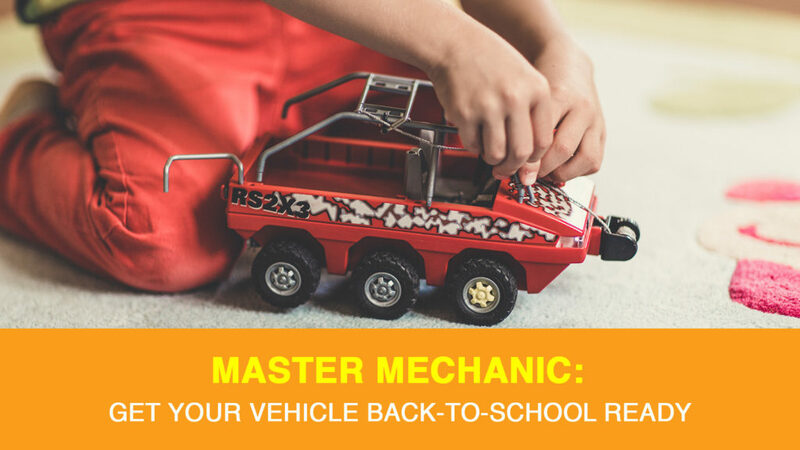 We asked a Master Mechanic to take us through the most important things to check on before kids head back-to-school. Rain, snow, or sunshine, you have to get your children to school. It’s important to make sure your lights are working–including your indicators–and that your wipers are operating efficiently. Driving with children can be incredibly distracting as is, and you don’t need anything reducing your visibility. If there is something wrong, these parts are easy and not expensive to replace. Trust us: the last thing you want to hear when you have a car full of children is squeaky brakes. Make sure your brake pads and rotors aren’t worn-out. If you suspect you’re getting close to the limit on your brake pads, it might be a good idea to get them fixed now. Check the pressure on each tire with a gauge, before driving the vehicle.. You should follow your manufacturer’s suggested pressure which you can find located in the car’s owner manual. This is a great time to make sure your spare tire is also inflated properly, and that you have the necessary equipment to perform a road side tire change if need be. This includes a jack, lug wrench, and (optional) an air compressor. Beyond risking a ticket, you do not want to risk the safety of the children in your car. Check all your seatbelts to make sure they’re working and ensure your car seat is installed properly if you have one. You’ll want to make sure your fluid levels are topped up. This includes oil, washer fluid, brake fluid, coolant, and many more. At Master Mechanic we cover it all during your vehicle inspection! Safety is the most important thing! While you’re driving, buckle up (you and your passengers), ensure you have enough sleep and be aware. Always look at the weather ahead of time, so you know what to expect, and give yourself enough time to commute to school. If you have any questions, need supplies, or want to book a vehicle inspection before school starts, contact your local Master Mechanic to schedule an appointment. We wish all our future drivers the best of luck going back-to-school this year!